When Amazon said they were discontinuing the Alexa 1M list (or making it a pay service), I was one of the people wondering if an alternative would appear. Shortly afterward, Cisco stepped up and offered their own free list. First, the list seems to be solving a fundamentally different problem. The Alexa list was displaying which domains were most popular for people using the Internet. This means actual people manually browsing to those sites. 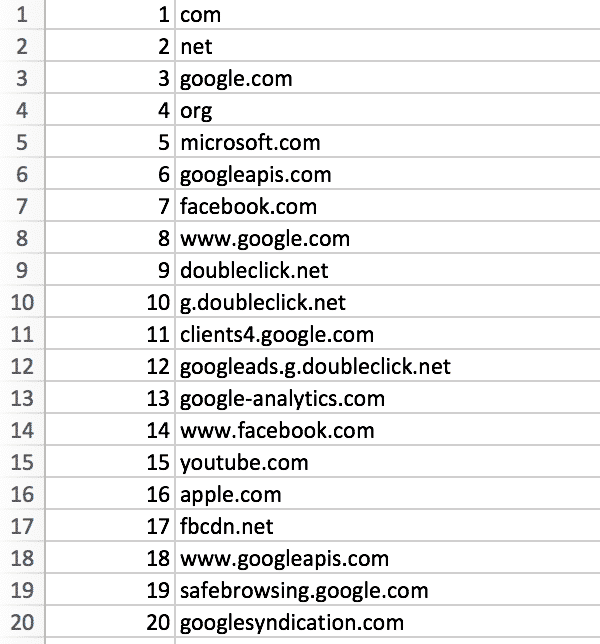 The Cisco list, on the other side, built a list of the most commonly queried domains period. This sounds better when you first hear it, until you realize it includes all the various background processes that occur constantly. So it’s every API call, every check for updates, every add request, etc. With Alexa’s list the use case was knowing which domains were most popular to people. You can use that to see what kind of sites they ran, what kind of content they produced, and if you are in marketing or have services to sell you could reach out to them to propose business. What’s the action you can take based on a list where doubleclick is ranked above facebook and youtube? It’s simply a model of the internet that I’m not sure is useful. I still applaud Cisco for putting out the list to fill a vacuum, but I think they’re going to have to get a lot closer to the original product if they want to accomplish what they set out to do.